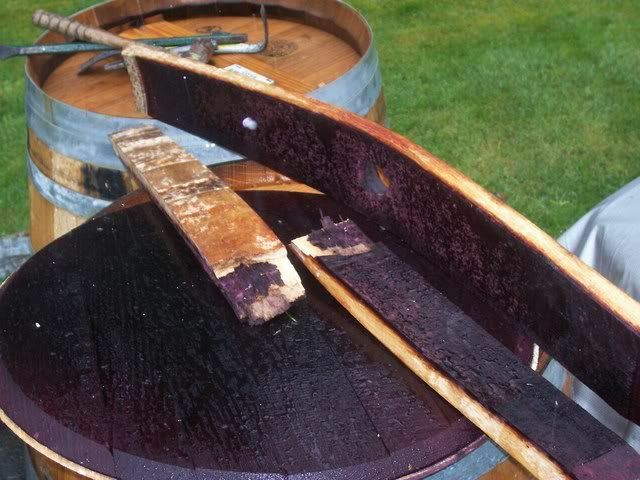 Confirmed Payment **White Oak Wine Barrell chunks** ** Mr.Bo for 50 ** - The BBQ BRETHREN FORUMS. I have a USPS Flat Rate box filled with White Oak Wine Barrell staves that I have cut into chunks. @ 9.5 lbs shipping weight. These casks contained Cabernet Sauvignon that I picked up locally. Very fragrant smoking chunks paired well with beef and poultry. I would like to start the bidding at $20. I don't do E-bay but feel I have a favorable rating with the Brethren I've dealt with. If there is a lot of interest, I may cut up some more so don't feel shy, bid high! Does it include the shipping? Thank you Kim! Package sent via USPS 6/2. That is some sweet smelling wood Brian. The WSM will get a taste of it this week end!!! !